In the municipality Weerselo have lived many Palestine-pioneers between 1934 and 1942. They were largely transferred to Dutch Reformed farmers. Palestine-pioneers were Jewish youths who were split by attending an agricultural training preparing for migration to the then Palestine, since 1948 in Palestine and Israel. Among them were many German Jews. Some of them joined later the Westerweel Group. One of the most famous here was surely the resistance fighter Max Windmüller, who lived in Hasselo by the ten Haar family. 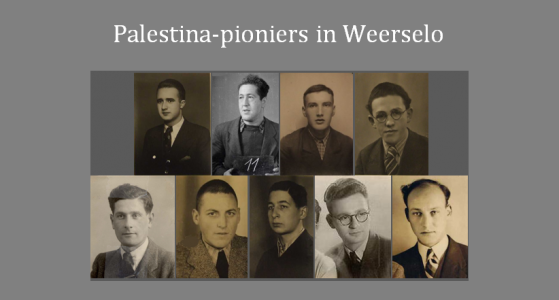 Of the total of 36 Palestine pioneers, who have lived in the municipality Weerselo, 25 have survived the war. This is partly due to the fact that they were young, strong and well organized. Helene Croner, Sigismund Ebel, Horst Eiger, Hans Eisner, Ferencz/Schraga Engel, Werner Ernst Hirschfeld, Hermann Kellner, Eduard Leefsma, Siegmund Theodor Lesser, Peter Salomon Misch, David Mühlrad, Walter Münzer, Kurt Nassenheimer, Abraham van Praag, Leonhard Prinz*, Hirsch Rajzenstadt, Simon Rath, Martin Rosenbaum, Klara Rothenberg, Herbert Rolf Rothmann, Günter Russ, Joseph Leo Slijper, Ewald Sondheimer, Jano Tansz, David Verliebter and Willi Weinberg.